With the iPad mini launch imminent, it’s time to think about the expanding iOS portfolio. We don’t know how much the “mini” will cost or what variants will be available but I took some rumors as a basis to form a hypothesis. The starting point would be $250 for an 8 Gb WiFi only model and increases of $100 for each doubling of capacity and $130 for the addition of cellular chipsets. The results would slot into an increasingly broad price spectrum. 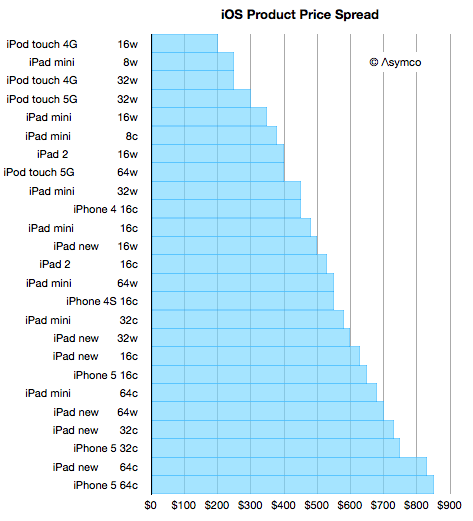 I included all the models of iPod touch, iPhone and iPad that we already have available and built the following graph. The number after each product name is capacity in Gb and the letter “w” signifies Wifi only and “c” signifies WiFi and Cellular. You can look through the list and see whether products of comparable prices are “competing for a purchase decision” or whether there is some marketing logic to the arrangement. I consider the purchase decision not to be determined by price but by many factors like the job being offered by the product. But in many cases buyers have a budget and are looking to fit a product into that price. This is more common when the product is a gift. So with that in mind I created a quick motion chart in Perspective to answer the question: Given a budget, how much iOS device can you buy? You can “dial in” various price points and see what products are available with graphical representation of capacity. Which iOS? 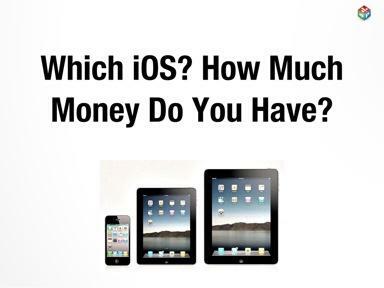 How Much Money Do You Have?. If you’re not an iPad but have one click on the “Send e-mail” to get a link in your inbox and open it on the iPad. If you don’t have an iPad but have an iPhone, stay tuned as an iPhone version of the app will be ready soon.